Ce Smith Guide On Sets are complete with Mounting Hardware. Each kit is meant for a slightly different application and boat hull design. 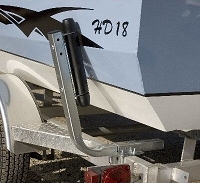 The intention of these Kits is to mount to the frame of your trailer to guide each side of your boat to stay center on your trailer while un-loading and loading. Each listing has state the Frame Widths and heights that they accommodate. These kits are most common on boats up to 20ft in length where currents and wind can make loading and un-loading tough. They are ideal for protection your boats hull from impacting your trailer fenders or the dock itself. They are very easy to mount and adjust to the exact needs of your trailer. If your looking for a boxed kit that fits your needs and will save the day in rough weather than these are for you. With universal mounting hardware you can quickly improve your speed at unloading and loading at the ramp.